(C) How can I add my own cartoons to the online database?! Students do a lot of reading in school. Yet there is one kind of reading that is generally given short shrift in second language classes: recreational reading. Recreational reading serves as a bridge between the simplified reading of early language acquisition and the heavy academic reading required in upper levels, such as AP courses. Even in programs with a lot of comprehensible reading at all levels, in class reading often consists of a single text read by the entire class. The hallmarks of recreational reading are missing: student choice, minimal or no assessment, and the ability to abandon the reading. Free Voluntary Reading (FVR) develops the habit of recreational reading among intermediate level language learners. 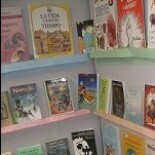 In my own classes students report that they enjoy reading in Spanish more when they chose the books that they read; in fact when comparing student responses to the same exact book, the group that chose to read the book consistently rates it as a more enjoyable experience than the group that read it as a class assignment. Among the benefits of a recreational reading program are the lifelong reading habits that students develop. 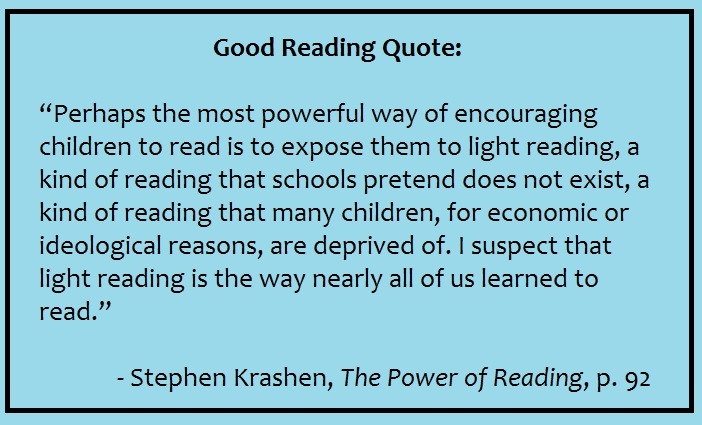 * These claims come from 81 Generalizations about Free Voluntary Reading by Stephen Krashen, click here to read it. 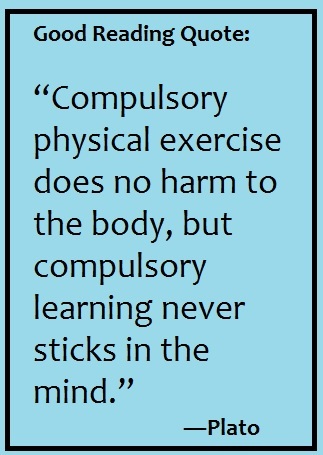 ** Good reading quotes curated by Bryce Hedstrom; click here to see his presentation on light reading. What do you call your FVR program in Spanish? “La lectura por placer”, and when I speak in English with parents I usually call it “pleasure reading”. I think both phrases get the main meaning across without sound wonky. Hey! Do you want to keep your library strictly Spanish or would you be open to other languages or ESL?